1. The atmosphere of the city with its beautiful sights and many green areas is enchanting and captivating. 2. The gastronomy, wines and special restaurants offer a wide variety of choice. 3. There are activities, programs and attractions for everyone, no matter of age, occupation and interest. Fastest way: By Taxi. Főtaxi, the taxi company with the longest traditions (founded in 1913) in Hungary transports passengers between the terminals and Budapest. Please be aware of exposing yourself at risk by using non-regulated taxi service providers soliciting at the terminal buildings. From 1 September 2013 a new Taxi Decree was introduced in Hungary regulating the price of the taxis at a fixed tariff of 300 HUF/Km (1 EUR/Km) in addition to the one-off basic fee of 700 HUF (2.50 EUR) and 75 HUF/min waiting fee. A ride to the city center should typically cost around 6500 HUF (22 EUR) depending on traffic conditions. TAXIFY. 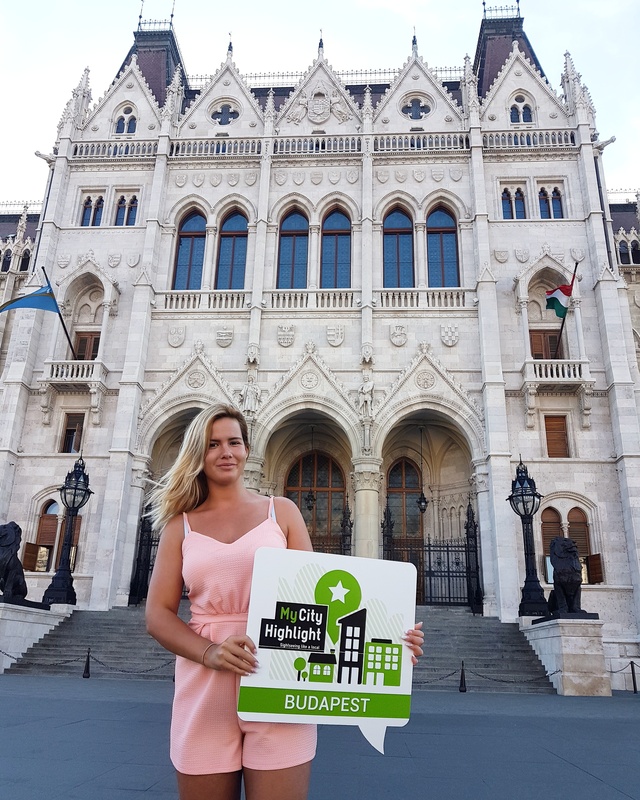 There is also an easy way dealing with cabs, you can download the free TAXIFY Budapest app and order your cabs via online. You can always check where is your taxi, when it will arrive, who will be your driver. Safe and Secure. 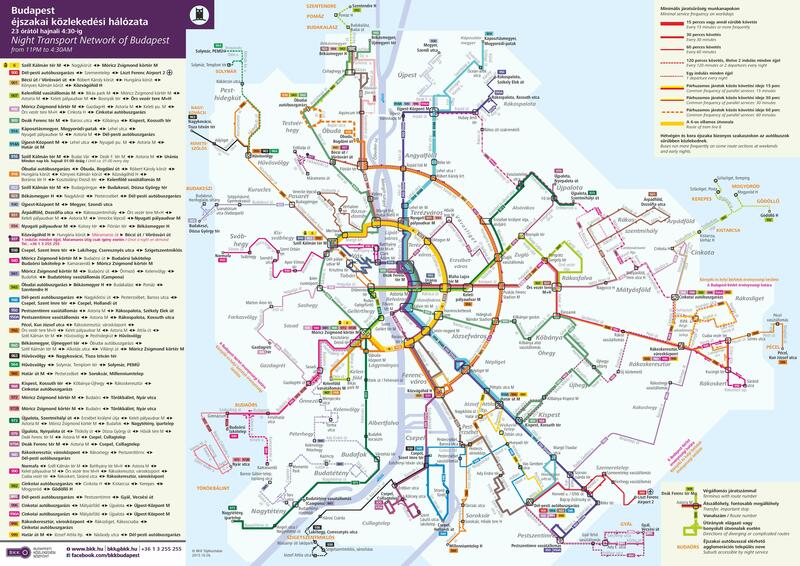 Cheapest way: From 4 am until 11 pm, bus number 200E operates between Terminal 2 and Kőbánya-Kispest metro terminal (metro line M3), via the Ferihegy train station (trains to the Nyugati railway station in Budapest). From Kőbánya-Kispest metro terminal, passengers can take the M3 metro towards Újpest Központ to reach the city center. 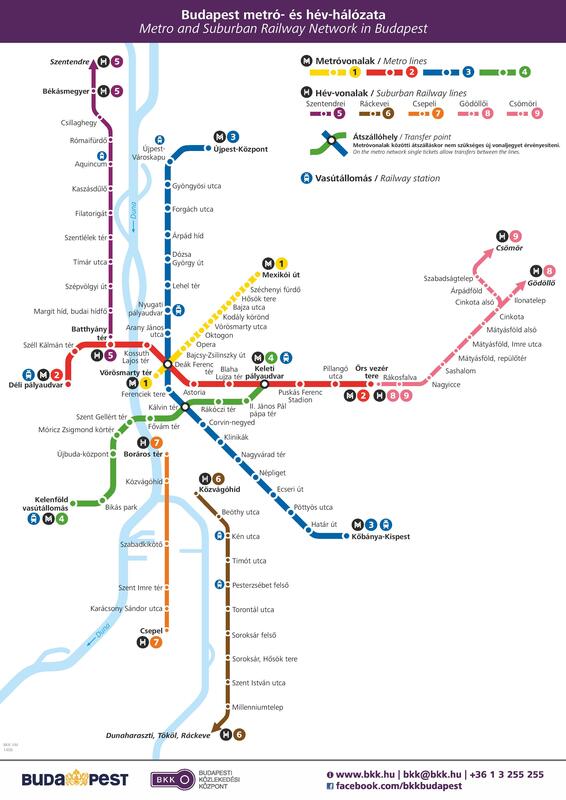 It is possible to change to metro lines M1 and M2 at the Deák Ferenc tér stop which is the main square of the city center. From 11 pm to 1 am bus 200E, from 1 am to 4am night bus number 900 oper-ates between Budapest Airport Terminal 2 and the South Pest bus garage. It is possible to change to night buses 950 and 950A, operating to the inner city. Passengers may get off the bus going to Deák Ferenc tér at Kálvin tér and at Astoria. Bus 100E going to the airport only stops at Kálvin tér, but the first two in the morning will also stop at the Astoria M bus stop. Tickets for public transportation priced 350 HUF are available at the airport at BKKs customer service points, at the post office, the newsagents (Relay) and at ticket machines right at the bus stop. It is also possible to purchase a ticket from the bus driver for 450 HUF. The direct Bus 100E costs 900 HUF. The post office is located on the mezzanine level of Terminal 2A, where 24 and 72-hour, weekly and monthly travel passes for Budapest public transport are also available. Newsagents only sell single tickets, 10-piece ticket booklets and short section tickets. The public transport works really efficiently in Budapest. You can get easily anywhere. Please find at-tached map but you can always get free maps at the BKK Customer Service Points. The service offers different type of tickets, here is a short summary that from my opinion are worth to purchase. Tipping: Hungarians usually tip when eating out, going to a bar or taking any services. Tipping in Hungary means you were satisfied with the service you got and it is usually about 10% of the price. Is the tap water safe to drink from the tap: Most of the places it is safe, some exceptions are trains, or festivals where water is stored, otherwise you are free to drink from any running water. Hungary is generally a safe place and easy to find all the places you are looking for, especially that I summarized all important facts you need to know. You can choose your apartment from a wide variety of options (see Hotels and Airbnb). If you come in the summer It’s worth visiting Lake Balaton, the biggest lake in Central Europe, that we usually call the Hungarian sea. But if you stay at Budapest you can still enjoy our thermal spas (most famous is Széchényi or Gellért Thermal Spa), because Budapest has the highest number of thermal springs and Hungary has public bathing practices that go back to Roman times and hundreds of different activity options. •	Hungary is one of the oldest countries in Europe. It was founded in A.D. 896, before France, Germany or England. •	The Hungarian Parliament is the 3rd largest parliament building in the world. It has 691 rooms, 20 kilometers of stairs and 40 kilograms of 23-carat gold was used on its interior decoration. It is also the largest building in Hungary. •	Budapest was almost named Pestbuda. Budapest was born when three cities, Buda, Pest and Óbuda (Old Buda) were united, and at first the founders had different ideas about what they should name the new city. •	The mummified right hand of Saint Stephen, the first king of Hungary is displayed in the Saint Stephen Basilica in Budapest. •	Touching the pen of the statue of Anonymus in Budapest's City Park will, legend has it, bless you with great writing abilities. •	Hungary is home to the world’s first official wine region. •	It is considered rude to clink your beer glasses, because while the 13 Martyrs revolution-ary leaders were being executed, Austrian soldiers were drinking beer and arrogantly clinking their beer mugs together in celebration of Hungary's defeat. •	Water polo is a national sport and the world’s best female chess champion is Hungarian. 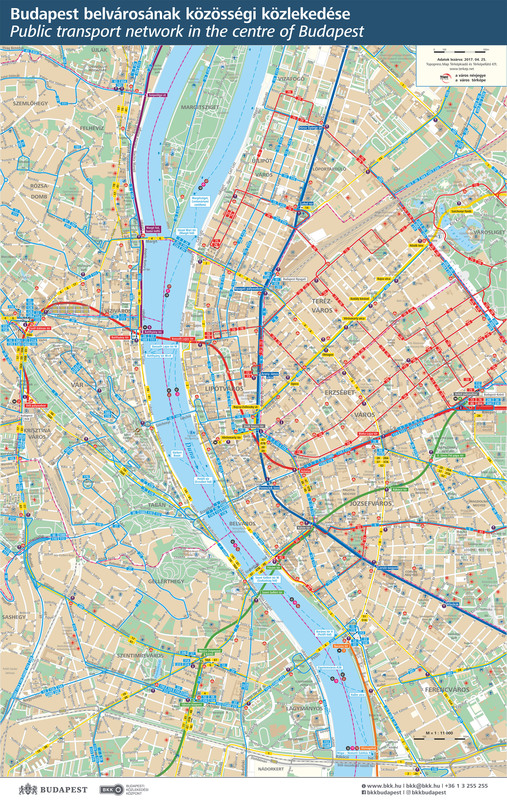 •	Budapest has continental Europe’s oldest metro and it is also the second oldest electrical-ly operated underground railway in the world (started operating in 1896). •	Budapest has the second largest synagogue in the world. •	Our language is in the top 10 of most difficult languages in the world, our alphabet has 44 letters and its only related to Finnish and Estonian. And we have two words for the color ‘red’? The two words are ‘piros’ and ‘vörös’. They can mean the same exact shade of the red color and still, for some reason, we don’t normally use both of them interchangeably with all the words. Blood is normally ‘vörös’, not ‘piros’. Wine is also ‘vörös’, not ‘piros’. A ball is normally ‘piros’ and not ‘vörös’. An apple is also ‘piros’, not ‘vörös’. But a rose can be ‘pi-ros’ and ‘vörös’ as well. Most places offer free wifi, but sometimes they might ask for a password though that you can get from the waitress, but even on the street you can sometimes connect to some open wireless. A great and convenient option are the Donkey Republic bikes. Rent your bike 24/4 via the Donkey Republic app (www.donkey.bike) and get 10% discount using the voucher code: MYCITYBUD. 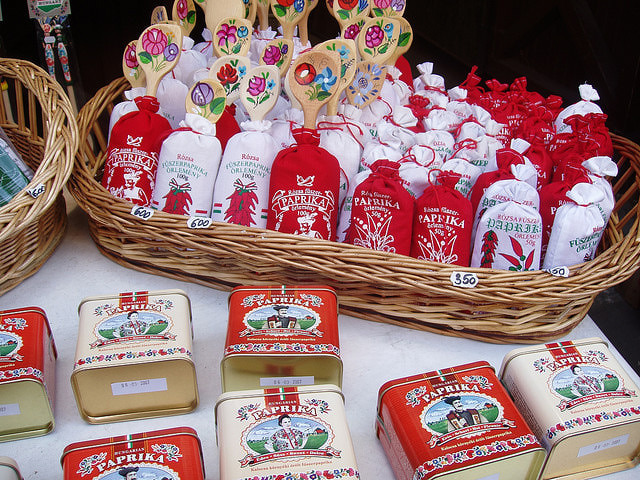 Cserpes tejivó "The milk bar"
People are always asking what gives the red colour of our local food and we say 'Paprika'. Paprika originates from Central-America and the Southern parts of Mexico. Here the spice has been known for thousands of years. The findings of Tehuacan Valley certify that 3000 years ago, the inhabitants have already grown the plant. We use this spice almost everywhere due to its nice flavour and colour that it gives to the meal. In many countries there isn't a big variety of spices, so you can't go wrong with this hungaricum that you find packed in traditional cover. Hungarians are famous for their special brandy that we refer to in small amount as medicine and in big amount as remedy. It has its roots in the 14th century. I can guarantee everybody will either love you or hate you for this fruity hungarian spirit. 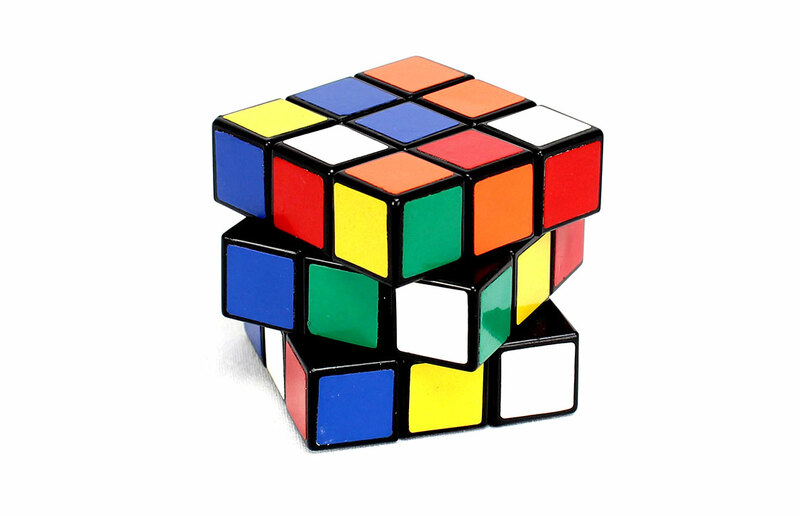 The Rubik cube is a 3-D combination puzzle that was invented in 1974 by Hungarian sculptor and professor of architecture Ernő Rubik. It took him one month to learn how to solve his first cube. It's a super fun gift that you can challange everyone with.